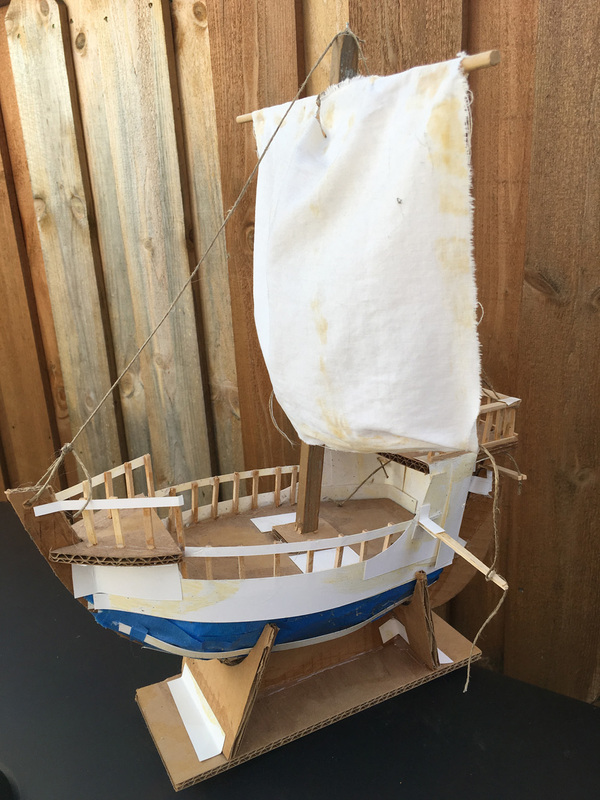 For the second issue/chapter of The Black Axe, I built a model of Conrad's ship: The Red Snapper. 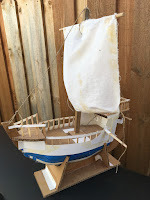 With the fan excitement over the video of Adam Savage talking to me about my models on Tested.com I wanted to do some videos where I talk about a specific model, how I built it, what the materials were, and why I built it in the first place. 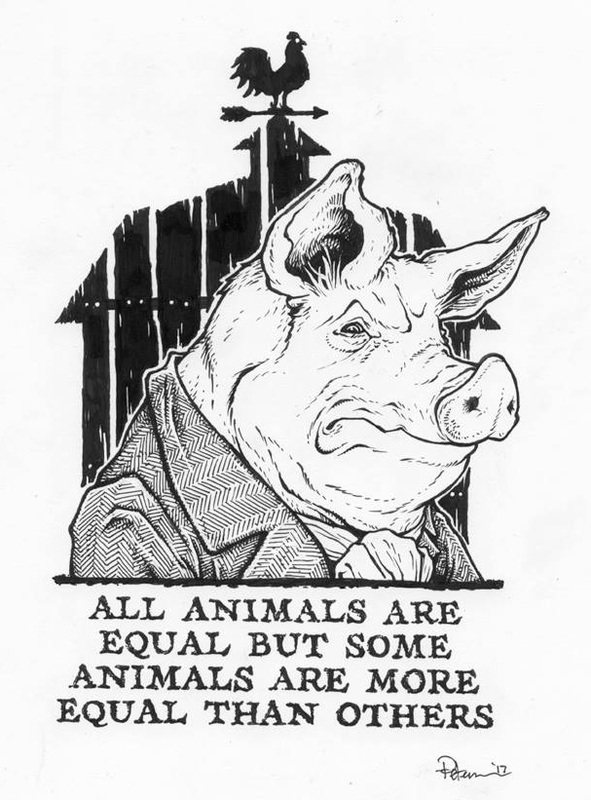 At a time when I was hearing from some fans on social media that they didn't think I should talk politics but post art instead, I decided to illustrate a powerful quote from a 70+ year-old book that would speak louder than my own type. The social media posts were shared, liked, & retweeted. The original art (left) was offered up for sale with 100% of the proceeds going to the ACLU. 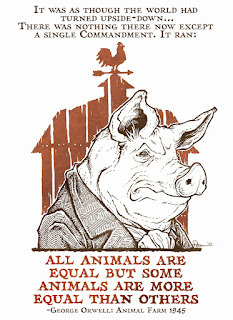 and use for your classroom, library, home, office, or march. 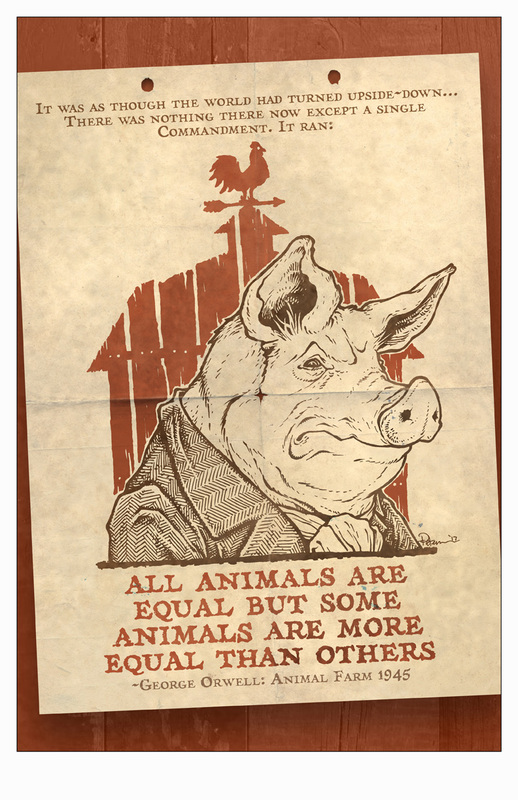 I've been trying to offer up more 5" x 7" matted prints at conventions and in my online store. 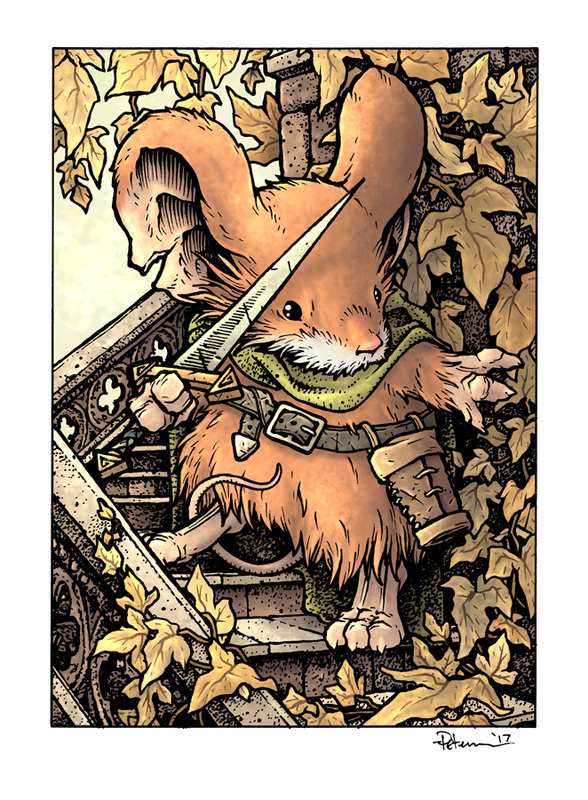 The most requested character for one of these prints in 2016 was Lieam. 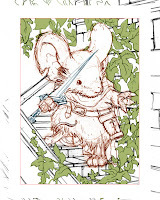 The redfurred mouse never was supposed to be as important to the Mouse Guard story as he ended up being, but after his heroic moment in issue #1, his role only became more important with each appearance. 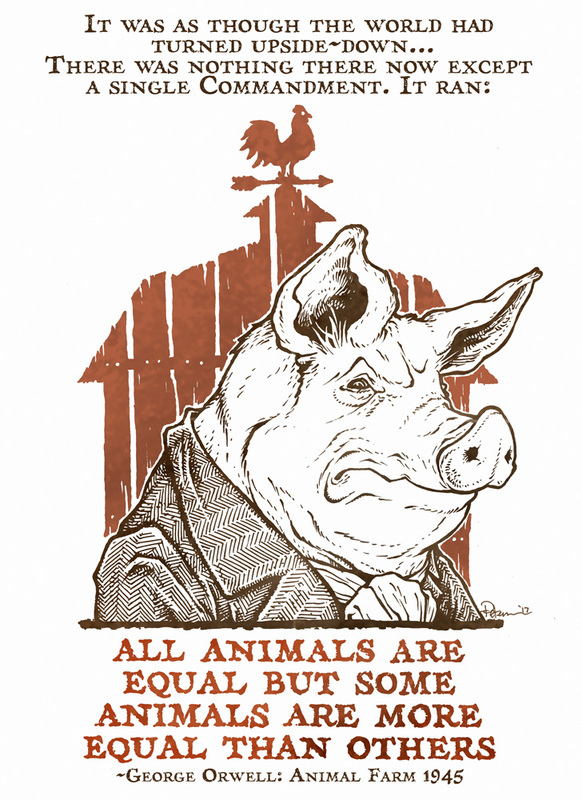 In today's blogpost I'll share the process for creating the image for this print. 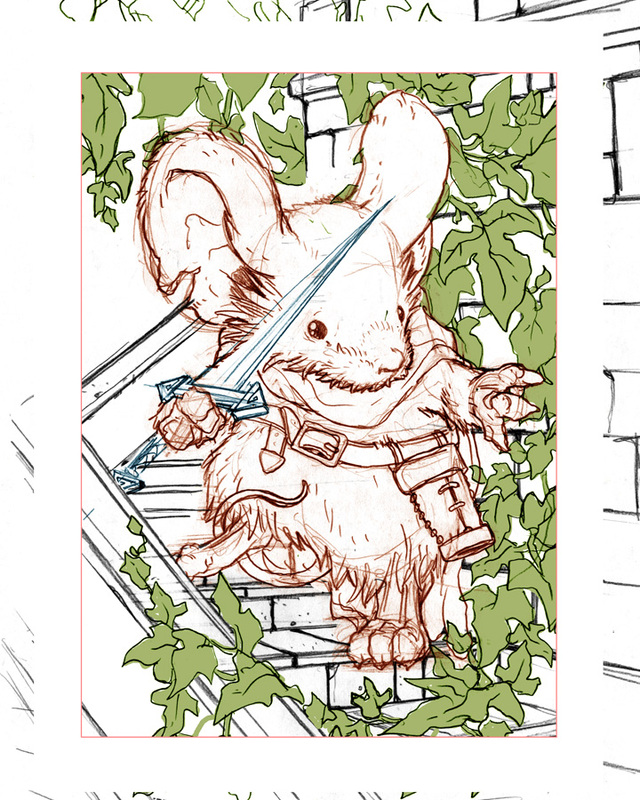 I merged together several rough sketches (one of Lieam, one of his sword, another of the stairs and then a fourth of the ivy) in Photoshop to create this rough. This way, I could reposition and alter each component (resizing, rotating, etc.) and add some tinted color to help me see the difference in what was ivy vs stone wall or Lieam himself. 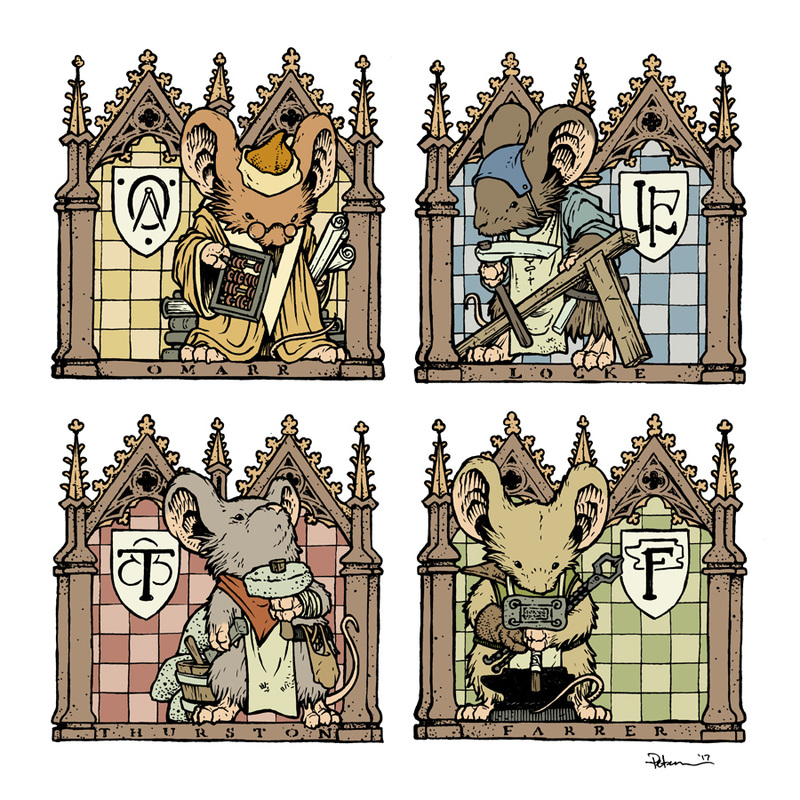 After scanning in the inked piece (and adjusting the levels and cleaning up any dirt, dust, etc from the scan) the first step to coloring is Flatting in colors. This means, like any good coloring book user, you color spaces inside the lines. But when flatting, you don't need to worry at all about shading, lighting effects, or even if you are going to use the real colors. After the areas of color are isolated by flat colors, I went in an rendered each part using the Dodge & Burn tools in Photoshop. I have my settings on Range: Highlights and 1% exposure most of the time and I use a textured brush. The final 5" x 7" matted print will be available at my 2017 convention appearances and in my online store. 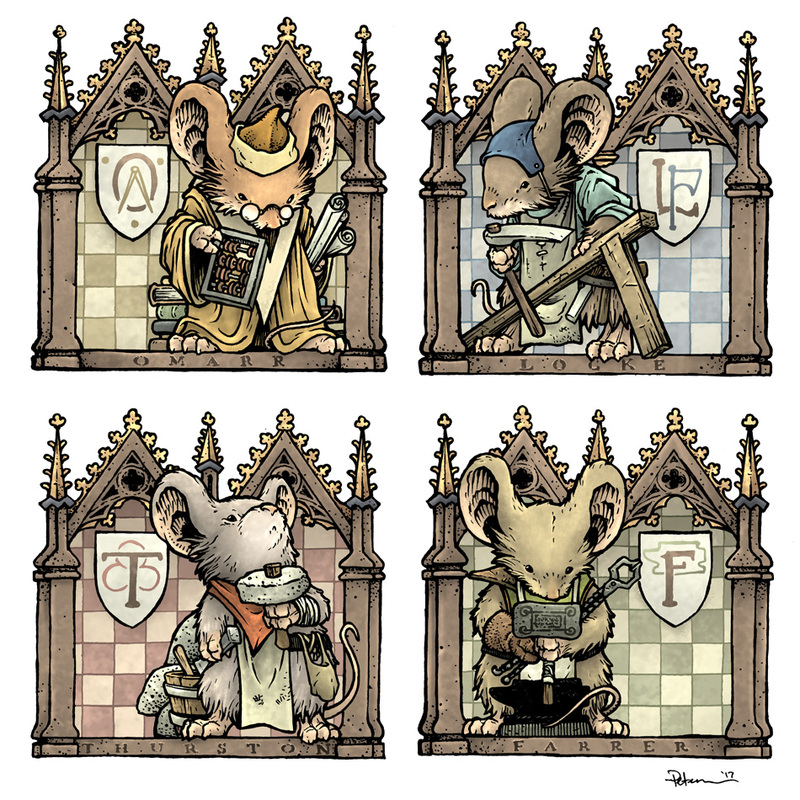 This piece of the four founders of the Haven Guild (see Mouse Guard: The Black Axe) will appear in my 2017 sketchbook. 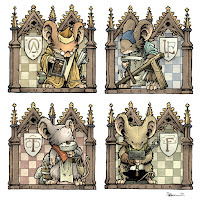 I'd depicted representations of these characters in various Mouse Guard volumes as embroidery and wooden statuary shrines, but never the real-mouse versions. 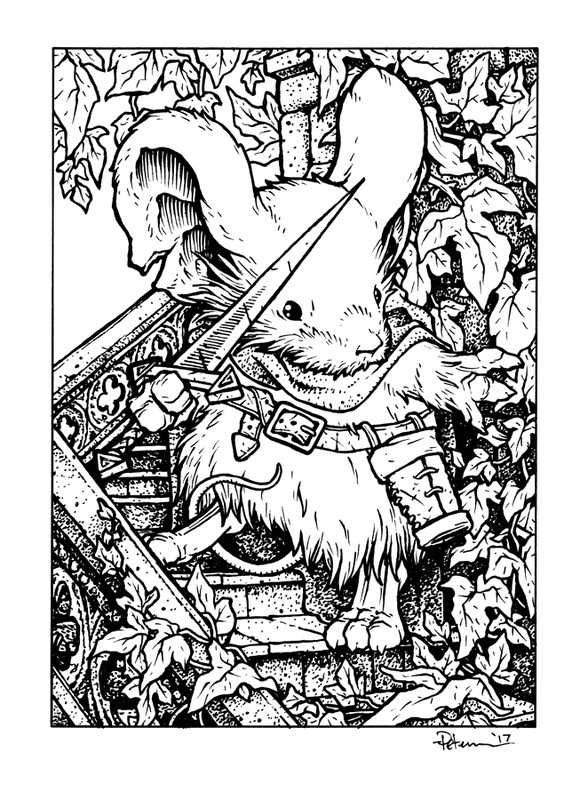 So, in an attempt to deepen the lore of the world of Mouse Guard, I created this piece both for reference as well as fodder for my sketchbook (to be available at SDCC and in my online store thereafter). 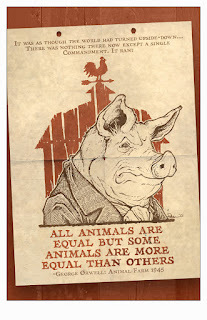 For today's blogpost, I walk through the steps (including a video stream) of creating this piece. 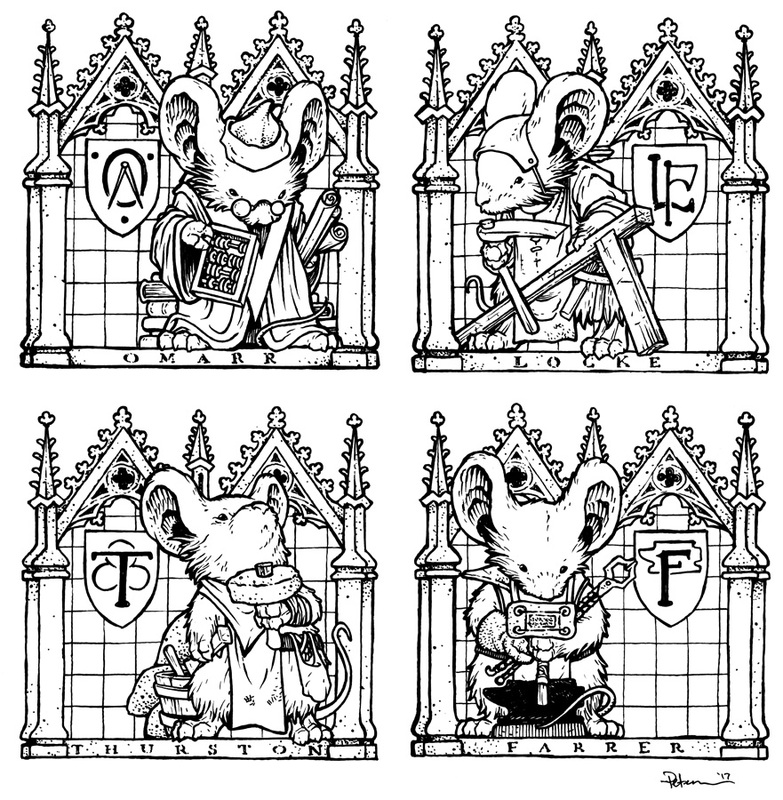 In The Black Axe volume, I'd introduced the clandestine order called the "Haven Guild", an architectural discipline group who held the secrets of creating the grandest of mouse architecture (including all the ins and outs of secret passageways for the Black Axe) as well as the most important developments for each of their trades. 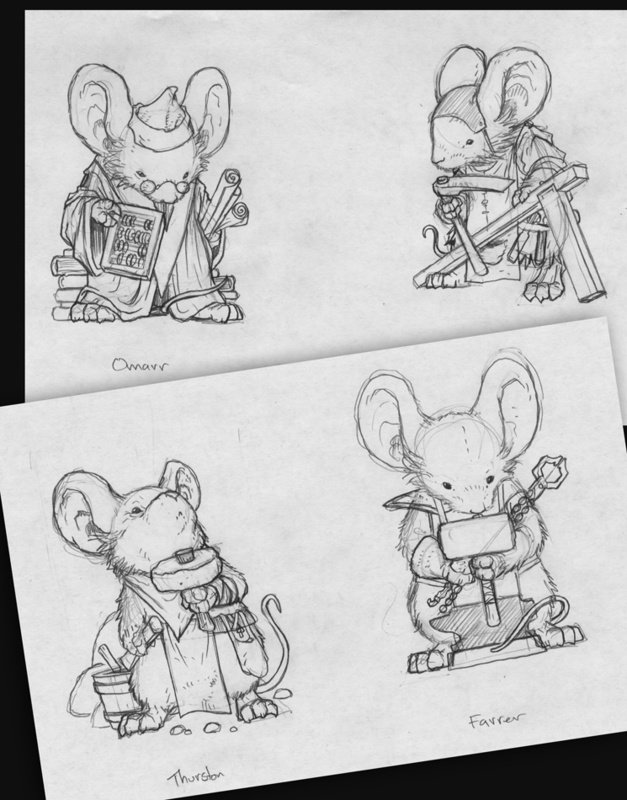 On copy paper, I drew out the four mice, roughly in the same posture as their wooden counterparts in Black Axe. 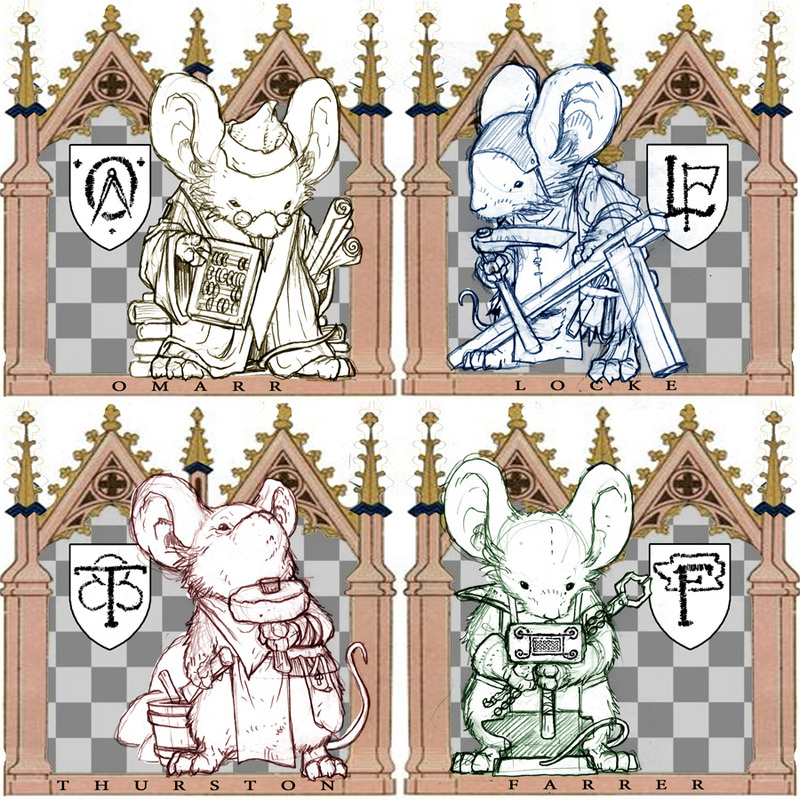 There are two other mice who play a role in the history of the Haven Guild, one is a rejected founder, the other a later addition...but for the purposes of the lore of the Haven Guild, there are only 4 founders. 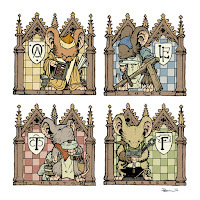 I'd always thought of these guys as my mousey versions of the Hogwarts founders, but perhaps without the drama of Salazar Slytherin exiting the group. 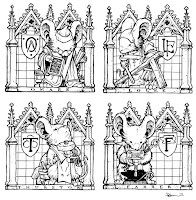 While wanting to show real-mouse depictions of the characters, I wanted the framing of them to still show some reverence, some clout, and prestige. I found a border pattern in an online search and then squashed, stretched, chopped, condensed, and tweaked it until it became a nice frame for each Haven Guild member. 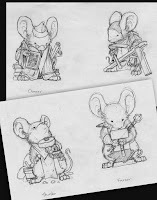 I dropped in scans of the mouse sketches (tinted for clarity) as well as each's symbol from the Black Axe Hardcover extras, and a checkerboard background and some typography for their names. I printed out the photoshop composited layout seen above onto copy paper. I then taped that printout to the back of a sheet of Strathmore 300 series bristol. On my Huion lightpad I can see through the bristol down to the printout and ink the piece without having to transfer it or erase any pencil lines. To ink I use Copic Multiliners (the SP aluminum bodied refillable versions) with the 0.7 & 0.3 nibs. Here again are the final colors. 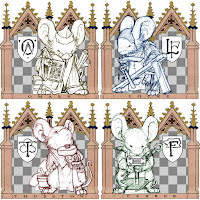 Using the Dodge and Burn tools in Photoshop with a stock textured brush, I rendered all the fur, clothing, checkers, borders, tools, and flesh of the Haven Guild. I also added some color-holds, a term which basically amounts to painting over the inkwork so those lines become a painted color rather than flat back. This allows me to temper the checker pattern grid, the type, and the symbols.